Oskar Blues Brewery expands distribution! (Longmont, CO, and Brevard, NC) — Oskar Blues will officially launch in the states of Arkansas and West Virginia during the week of August 24th with events and crew drives throughout both states. The brewery will have a team in the Mountain State of West Virginia starting on Monday, and Oskar Blues will be working alongside sales teams from Mountain Eagle Distributing, Mountain State Beverage Co, Proud Eagle Distributing and Northern Eagle Distributing. Oskar Blues Brewery will also be in Arkansas the same week, working with Arkansas Craft Distributors, and offering tasting events throughout the state (see below). Oskar Blues year-round line-up of fresh craft beer will be available, including CANS of Dale’s Pale Ale, Mama’s Little Yella Pils, and Pinner Throwback IPA in both 12 and 19.2-ounces. Twelve-ounce cans of Old Chub Scotch Ale and the recently released Oskar Blues IPA will be available as well. In addition, the Canundrum 12-pack, featuring four different Oskar Blues beers, will be available in retail shops. Oskar Blues kegs will be made available next month with a full draft launch in both states. Puritan Brews with Fayettechill Outdoors. Tap Takeover with Oskar Blues beers featured on the Crowler Station. The Pressroom, Tap Takeover, Bentonville, next to Phat Tire Bike Shop. Mellow Mushroom – Rogers, AR. Oskar Blues Trivia Night featuring two beers on tap and two cans. Winning team gets an Oskar Blues swag bag. Fayetteville Roots Fest VIP Evening Featuring Oskar Blues, Mother’s & Lagunitas. Outdoor beer and music festival. Mellow Mushroom – West Little Rock, Pinner Winner Pizza Dinner – 7 p.m.
Raffle and drawing for Oskar Blues swag bag. Boulevard Bread Company–Bike into Boulevard! From 5-7 p.m. Free bike check-ups with Spokes Little Rock & Oskar Blues Happy Hour. Flying Saucer Little Rock, Oskar Blues Can Toss – 7 p.m. Prizes provided by The Water Buffalo Brewing and Gardening Supply Shop. Raduno Brick Oven & Barroom, Oskar Blues Happy Hour. From 3-6 p.m. $2 off Oskar Blues beers. Stickyz Rock N’ Roll Chicken Shack, Oskar Blues Presents ‘The Suffers’ – 7 p.m. $4 Oskar Blues cans all night. Dale’s Pale Ale: As Oskar Blues’ flagship beer, this American Pale Ale delivers balanced rich flavors of malts and hops (6.5% ABV, 65 IBUs). The award-winning beer was named the "Top U.S. Pale Ale” by The New York Times and is the number-one selling pale ale in ColoRADo. 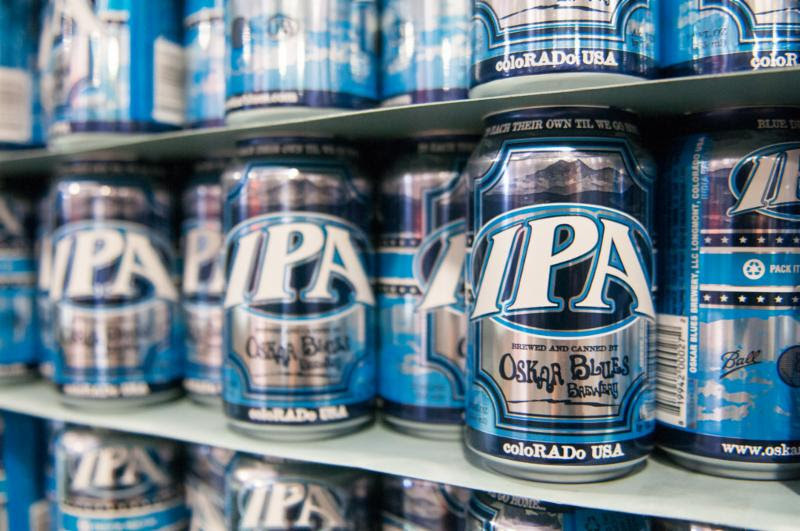 Oskar Blues IPA: A metamodern IPA created from hand-selected hops from down under. Malt barley and red wheat combine to create a clean malt backbone with foolproof flavor and mouthfeel to support the main act of Enigma, Vic Secret, Ella, Topaz, and Galaxy hops. The hops strum juicy and sweet aromas with headline notes of passion fruit, raspberries, pineapple, and citrus (6.43% ABV, 70 IBUs). Pinner Throwback IPA: Crushable India Pale Ale with a delicate balance of citrusy, tropical hop aroma and a toasty, biscuit-like malt backbone (4.9% ABV, 35 IBUs). Mama’s Little Yella Pils: This Bohemian Style Pilsner offers a refreshing balance of Saaz hops and specialty German malts while providing a gentle flavor (5.3% ABV, 35 IBUs). Like summer in your mouth. These launches follow additional Oskar Blues distribution in Vermont, Missouri, Louisiana, Indiana, Maine, Iowa, Kansas, Nevada, Delaware, Minnesota, Idaho, Nebraska and Illinois over the past two years, bringing the number of states that Oskar Blues distributes in to 44 total, plus Washington, D.C.The remaining U.S. states will be added in 2016. Founded as a funky little brewpub by Dale Katechis in 1997, Oskar Blues Brewery launched the craft beer-in-a-can apocalypse in 2002, using a tabletop machine that sealed one can at a time. In 2008, the makers of the top-selling pale ale in ColoRADo, Dale’s Pale Ale, added a brewery in Longmont, ColoRADo. The brewery has since experienced explosive growth–from packaging 59,000 barrels of beer in 2011 to 149,000 barrels in 2014. In December 2012, Oskar Blues opened the doors to an expansion brewery in Brevard, North Carolina. Oskar Blues has continued craft can innovation by introducing the CROWLER as a canned off-premise growler alternative. The innovative, original canned craft brewery now distributes trail-blazing craft brews to 44 U.S. states, Washington, D.C., as well as parts of Canada, Sweden, and the U.K. For more information and social media visit http://www.oskarblues.com.